KZN music lovers are currently the beneficiaries of a new spirit of collaboration between Durban’s Friends of Music (FOM) and Christopher Duigan’s Pietermaritzburg-based Music Revival associations. This welcome trend saw the latter offering up a combination of two of its recent programmes that have been performed across the province, telescoped into one, for the benefit of FOM’s audience at the Durban Jewish Centre last night (Tuesday, April 10). Performing something of a double bill, pianist Duigan shared the stage with cellist Aristide du Plessis in the first half of the evening. 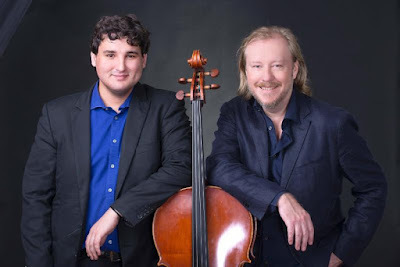 With both instrumentalists presented as equal partners, this showcased the emotive vocality of cello as a solo instrument, with a selection of items built around Rachmaninoff’s towering Sonata for Cello and Piano in G minor Opus 19. Dedicating his own performance of the work, that heart-rending third movement in particular, to the late Russian maestro, made listening to Du Plessis’s own sublime rendering of it especially poignant. I can only say my admiration for this young artist-in-our-midst continues to grow with every hearing of his thriving young maturity I am privileged to witness on our concert stages. His breath-taking virtuosity in Tchaikovsky’s show-piece, Pezzo Capricioso, brought the first half of the evening to a close with a welcome emotional reprieve. Having more than held his own in dispatching the very considerable demands, both emotional and technical, that are embedded in the piano part of the Rachmaninoff work, the indefatigable Duigan proceeded to astonish his audience with a further display of virtuosity – both his own as a performer, and that of the endlessly fecund – but, to my ears, essentially cerebral – facility of George Gershwin. We were treated to superfine performances of the American composer’s widely-contrasting Three Preludes, followed by exquisitely played accounts of the composer’s own transcriptions, contained in the spun out Gershwin Song Book. Then onto the well-tried Rhapsody in Blue, rendered in its barnstorming solo piano edition. If the pianist wasn’t ‘wrung dry’ after delivering such an onerous programme, this listener certainly was as its recipient. What a feat!